Research, brand strategy and website development for global crowdfunding company. A seasoned entrepreneur was looking to start his next business venture but needed a team with the savvy to carry out his dream from idea conception to launch. The idea? A website that utilized crowdfunding as the catalyst for making groundbreaking events happen. The first step in helping his abstract idea become a reality was to define a specific direction, which we were able to outline after extensive brainstorming sessions, competitor research, analysis, market definition and research. With a clear strategy defined and a new name selected - Newstarter - the next step was to develop a prototype to test how users interacted with a basic version of the proposed website model. The feedback gathered from several focus groups validated the strength of our original idea and provided us crucial insight on how to further improve users’ experience with Newstarter. After creating a detailed business strategy, it was time to tackle how to position Newstarter as a brand, and that meant thinking long term: What is Newstarter’s mission? How do we want the world to perceive Newstarter? What do we want to be the future of Newstarter? We not only answered these important questions, but also addressed alternative scenarios that identified future potential challenges and situations the company could encounter. A clear Brand Action and Component Plan contained specific activities that needed to take place in order to accurately convey the Newstarter brand, and an expertly crafted logo and brand system kept all materials looking unified and cohesive. 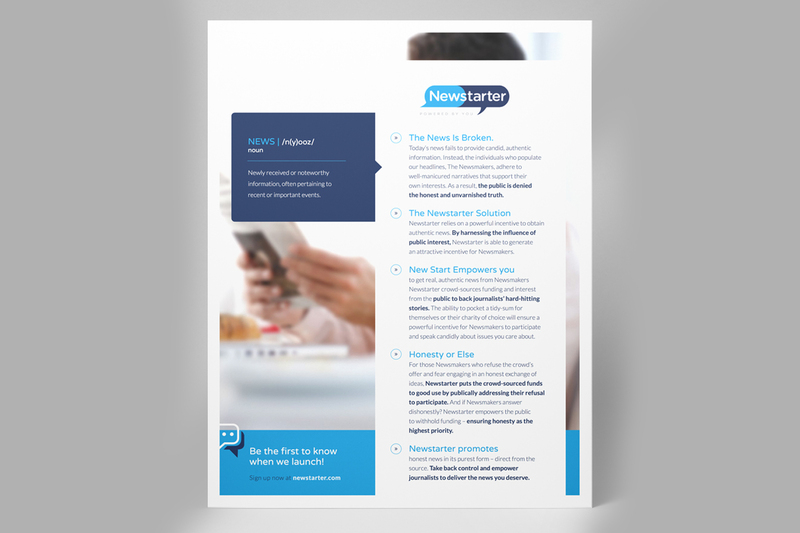 To define the steps Newstarter needed to take in order to reach customers and achieve competitive advantage, we developed a detailed Go-To-Market Strategy. This strategy outlined the company’s Value Proposition, Market Segmentation, Channel Strategy, Promotion Plan and Operating/Launch Plan. Since the website was going to be the center around which everything Newstarter would revolve, it was imperative that we base all design and development decisions around what would best create the highest quality experience for the user. 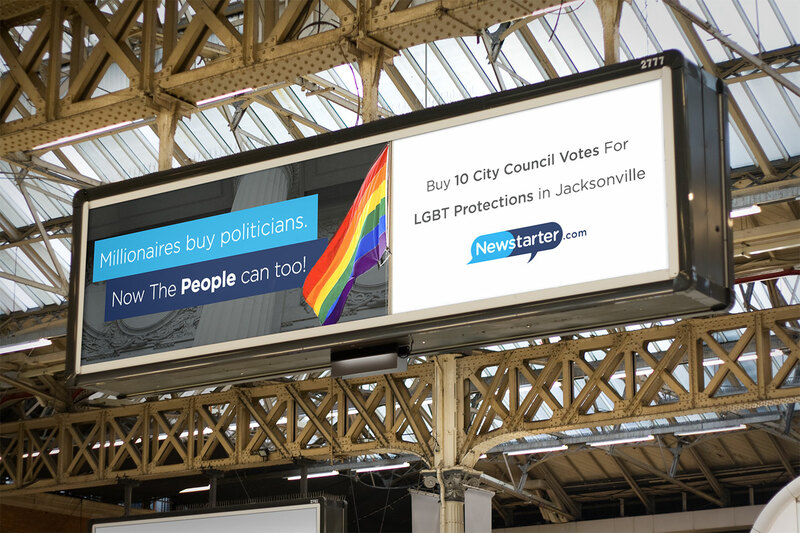 The site's clean and simple design and structure helped users to navigate page to page with ease, and the site's crowdfunding functionality allowed users to easily donate an amount of their choosing to each campaign. On the backend, we built out a custom content management system which allowed administrators to upload campaigns and content as needed. We developed the framework in a way that allowed site admins the flexibility to make changes when necessary based on their needs at the given moment. To further enhance the user experience, we ensured that the site was designed in a way that was optimized for web, mobile and tablet users. "We knew executing our unorthodox idea from conception to launch couldn’t be done by just any marketing agency, which is why I chose MODintelechy. Their high level of exhaustive research and strategizing, ingenious problem solving and thought-provoking creative is simply rare to find." As word continues to spread about Newstarter and its mission to making newsworthy events happen, the number of site visits and amount of money donated to making these events happen grows daily.